Danny Strong is a man of many talents. You might know him from his superb acting work on Gilmore Girls and Buffy the Vampire Slayer. 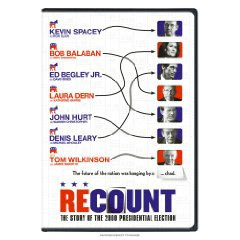 I saw the HBO movie Recount and was pleasantly surprised to see his name credited as scriptwriter. Delving into the controversial Florida results in the 2000 presidential elections, he managed to present a fair and objective story, although he does lean more towards the Democratic side. Republicans probably weren't too happy with this TV movie, especially the strategizing and maneuverings of James Baker (played by the always scary Tom Wilkinson) and the rest of his political team. The all-star cast give outstanding performances. I was especially moved by Kevin Spacey's Ron Klain (Gore's former chief of staff) and Ed Begley, Jr. as lawyer David Boies, fighting to have every last vote counted. Laura Dern was appropriately campy, clueless and insipid as Katherine Harris, the villainous former Secretary of State. I remember my heart sinking when George W. Bush was declared President-Elect, not believing that this could happen in America. Watching this film stirred up those old feelings again, especially now that we have the past 8 years to look back on. Even though we all know how the movie ends, it's still suspenseful. It is a fascinating and intriguing look into the inner workings and failings of democracy. I never thought chads and hanging ballots could be so interesting! As we all head out to the polls tomorrow, we can only hope that a moment like this in U.S. history and politics will never happen again.